As the 2016 Wimbledon Championship began this week, Drive Productions appoints Kru Live to launch Jaguar’s Feel Wimbledon campaign; an experiential campaign at London Waterloo Station. 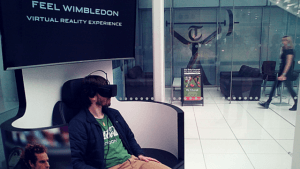 Using Virtual Reality technology to provide commuters with the chance to experience what its like to be on centre court, tennis fans can step into the shoes of Andy Murray as part of Jaguars #FeelWimbledon Campaign. The experience takes place in a Jaguar F-PACE seat, which ties both the experience of the new Jaguar F-PACE and being at this years Centre Court at Wimbledon.